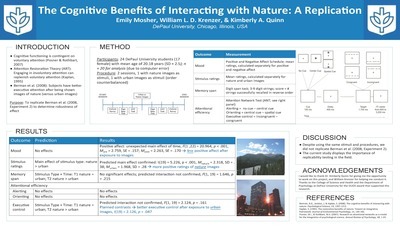 "The Cognitive Benefits of Interacting with Nature: A Replication" by Emily Mosher, William Krenzer et al. Berman, Jonides, and Kaplan (2008) hypothesized that natural environments replenish voluntary attention, and demonstrated that after exposure to nature (versus urban) images, participants performed better on measures of executive attention (Experiment 2). We conducted a direct replication of Berman et al. to evaluate the robustness of these findings. The replication was unsuccessful with the current experiment showing significant results opposite of what was hypothesized indicating that participants did better on executive attention tasks after being exposed to urban images. All other measures yielded insignificant results challenging whether the effect found in the original paper was accurate. Further studies must be concluded to confirm whether or not the effect exists.